"A yummy soup that even picky kids will love! 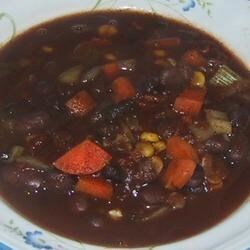 Red beans and black beans are mildly seasoned and simmered in vegetable broth. With these ingredients this is a healthy vegetarian soup with a complete protein. If you add the chili powder, leave out the maple syrup. It totally changes the taste. Garnish with sour cream, green onions and tortilla chips for a festive meal. This is great served with cornbread." Great, used 1/2 can of Rotel tomatoes to add extra flavor to the Chili powder version. Also added Barley for a healthy grain. Kids liked it too because they couldn't see any tomatoes! I made this for a chuch function last night, but left out the maple syrup. It was HUGE hit!